Welcome to Fabulous Fall! 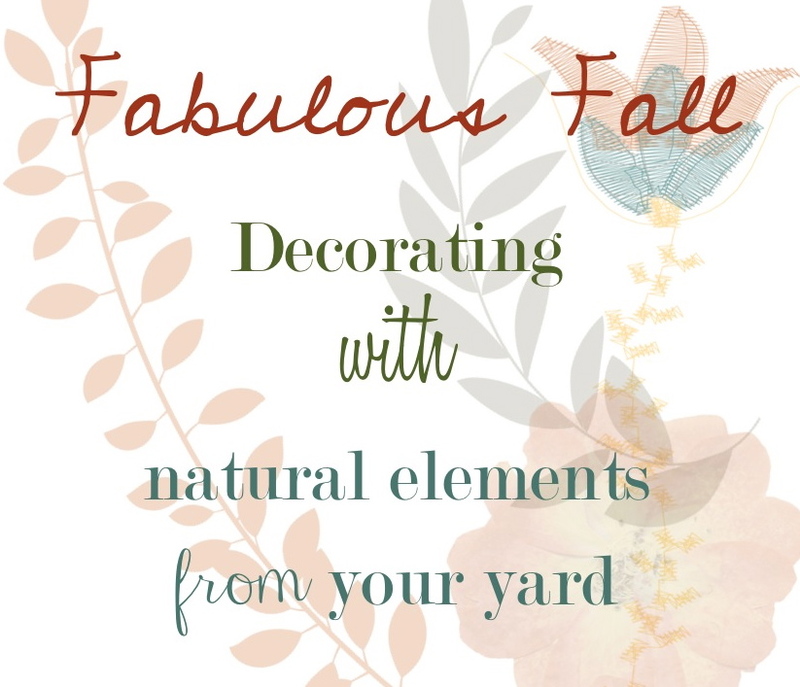 I’m joining the amazing Jennifer Rizzo today along with 7 other talented bloggers to bring you some ideas and inspiration for Decorating with Natural Elements. You know, I used to have this “faux” ficus tree. I vividly remember seeing this big empty corner in our first apartment after we got married and telling my husband that we really needed to put a ficus tree there. I mean, my mom had one and his mom had one and surely that’s what married women do, right? They go buy ficus trees! I took my newlywed self to the craft store and pulled every single ficus tree they had into the aisle so I could study them from all angles. Kind of like when you’re picking out a Christmas tree and need to make sure there aren’t any “bare” spaces. Except in this case, I knew that at least I could bend the branches if I needed to fill in a spot! I finally made up my mind and picked out THE BEST ficus tree and proudly took it home to our apartment and plunked it in a corner and declared the space “decorated”. That ficus tree earned it’s keep. It went from apartment to apartment to town-house to first home. But, along the way it got sad…and more sad…and even more sad. 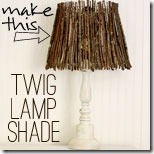 Even though it was “faux”, the branches seemed to droop and the layers of dust began to build until it had a slightly “gray” tint to it. It was at this point that I decided I would have to break up with my ficus tree. It wasn’t working for me anymore. I needed something fresh and new. We had a “it’s not you, it’s me” conversation and I loaded it into the back of the car and donated it, trusting that it found a lovely new home in which to reside….and that they dusted it. But, there is just nothing like “real”, is there? 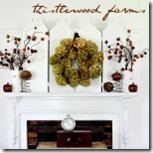 Real pumpkins, real gourds, real dried hydrangeas and real branches from the maple tree in my backyard. 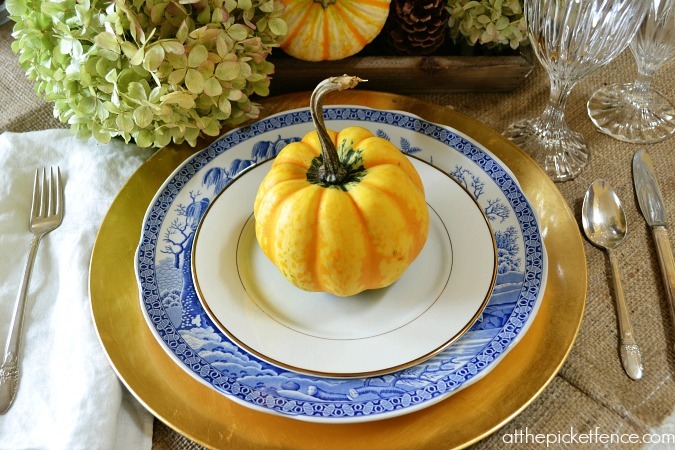 A faux gourd would look fine…but a real one with a twisty stem sitting on a plate just makes me smile. And there is nothing like the soft rustling of corn husks. 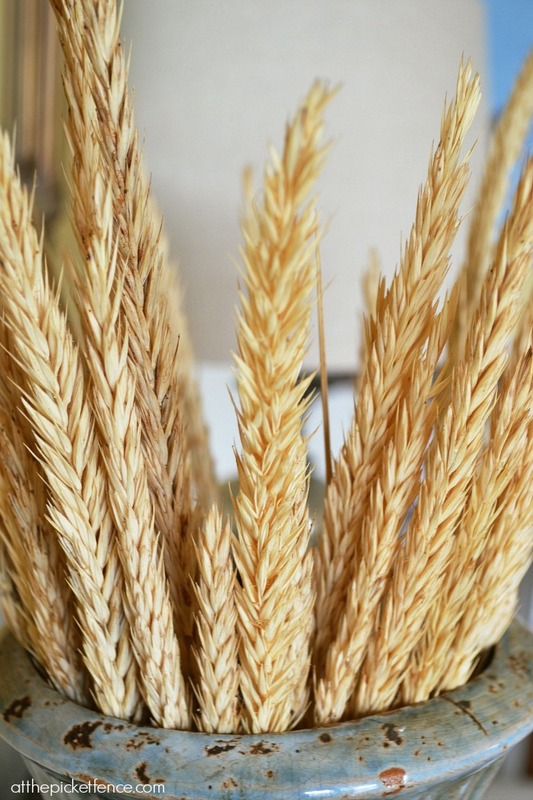 And it’s just as easy to add real wheat to an urn as it is to add faux wheat, isn’t it? But you simply can’t compare the beauty of the real deal to it’s faux counterpart. I think my favorite thing about decorating with nature is how uncomplicated it is. 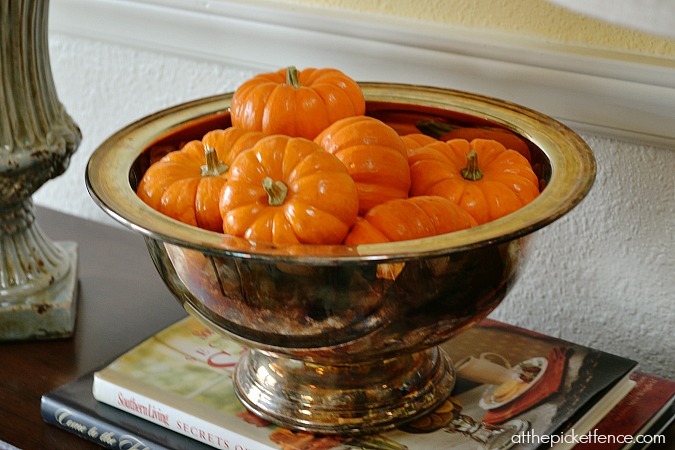 The beauty of the elements, like pumpkins piled high in a silver bowl, stand on their own. No need for too much embellishment. I’m not going completely and totally au naturale. There will be foundation, concealer, tweezers (thank the good Lord! ), eye shadow, eye liner and mascara. There will be faux orchids and faux branches and faux berries and faux boxwoods. But, more and more, there will also be nature. The celebration of the beauty of this Earth and all that is in it. And I know with this approach to decorating I won’t ever have to have another “it’s not you, it’s me” conversation again! 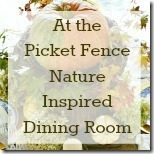 Now, how about some more ideas and inspiration for decorating with nature? 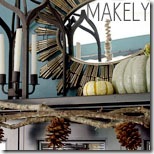 Check out all of the other projects being shared as part of this fun Fabulous Fall Party! 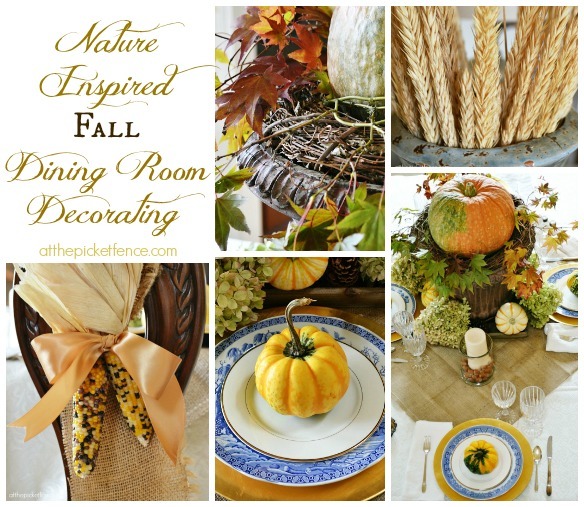 44 Comments on "Nature Inspired Fall Decorating & A Break-Up"
This is one instance where natural is preferred! As for my hair and makeup routine, going natural could scare small children. Everything is just lovely! 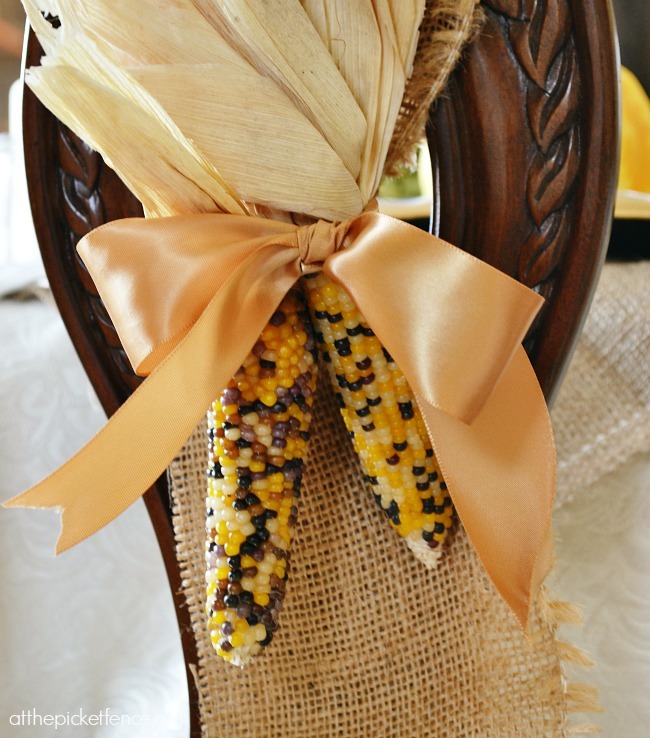 The centerpiece is gorgeous and I love the corn husks on the back of your chairs. May I ask how you attached the burlap to the chair? Hi Kelly! I laid the burlap on the top of the chair and then pulled one end through the little key-hole type opening in the back. 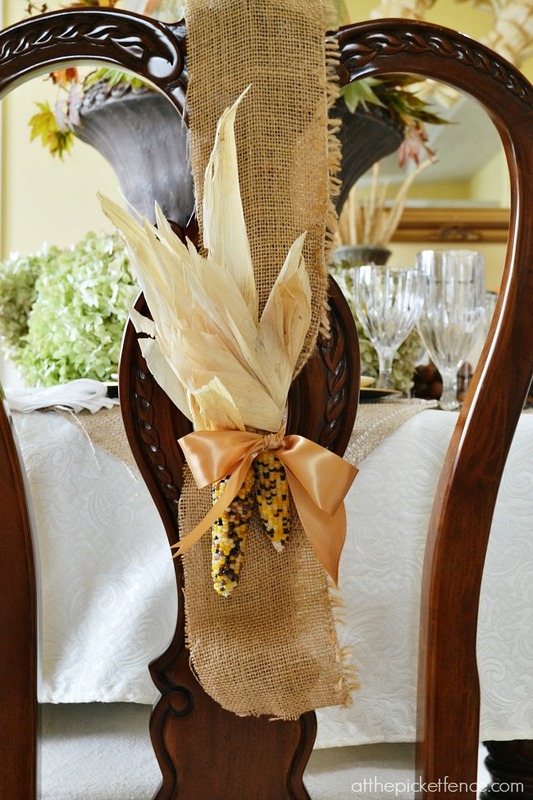 Then using the ribbon I tied the corn to the the burlap. Easy peasy! Thanks for coming by! Your table is lovely…I just threw my faux ficus to the garbage last week…for sometime now it has been out in the garden by the water feature…Nature has been providing us a great bounty and never lets us down even in decorating – great inspiration! It looks lovely! I love the ficus tree story :)I love the way the pumpkin and branches are in the urn with the wreath.It so simple, but so pretty. I just lugged my faux ficus up to the attic last week. It’s the last step before it leaves the house. I have to do these things in stages, you know. You house looks stunning with all of it’s real fall decor. I feel like I need to go shop this morning for some real pumpkins. You have totally inspired me…as usual. Gorgeous!!! Stunning! Everything is just beautiful. 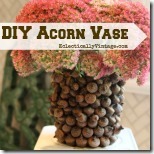 I just love your blog and always find so many ideas to use in my own home. Thank you for the beautiful pictures and all of the wonderful information you provide to us beginners out here. Oh and btw, Roll Tide! Thanks so much for coming by Kathy! Stunningly beautiful decor, Vanessa–all real! Or maybe we should say all “organic.” Plastic is a real material, after all. 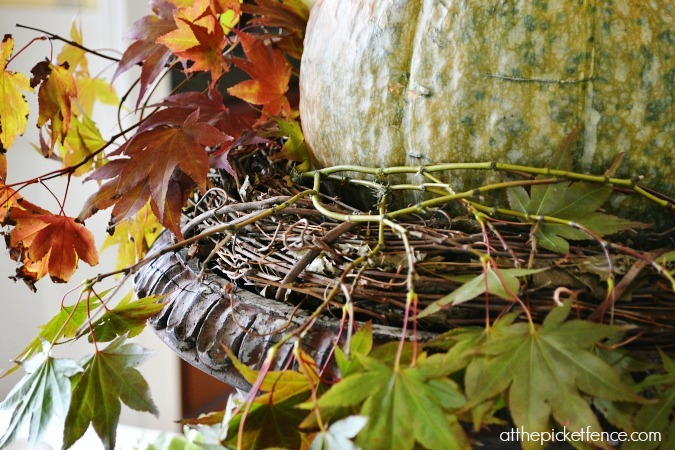 I posted yesterday about how to make faux pumpkins look more real, which is a fun challenge. . . but always the real-life element looks the very best. Nothing beats the beauty of the things God made! Stunning! This is much better than my fake pumpkins, you can roast these later and not need to have any more holiday bin décor in storage. Brilliant! So gorgeous Vanessa!! 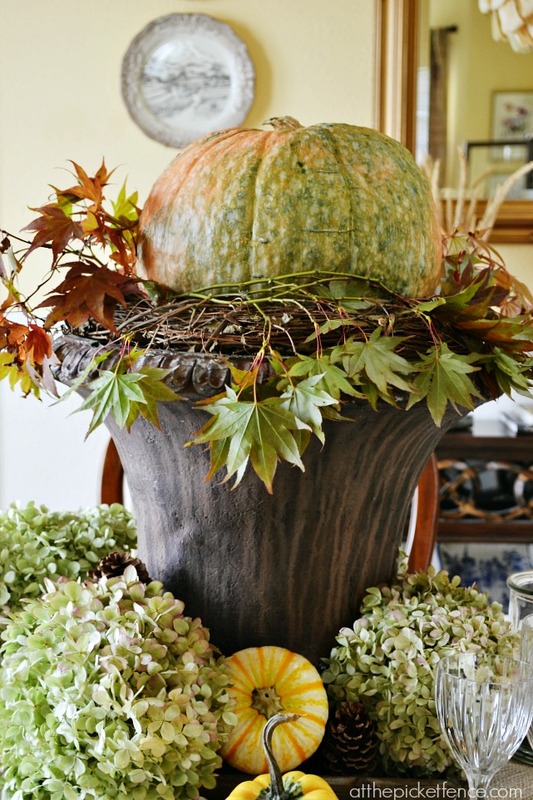 I love how the leaves perfectly match your Pumpkin in the urn, the green and orange combo is really striking!! Hey, I hear big eyebrows are back in style! Time to go au natural in other areas! 😀 And I, too, gave a dusty ficus tree the boot a few years back. What was with those things?? They were like a requirement in the 90’s. Love your real-deal decor, Vanessa! This was such a fun challenge! I’m trying to type….but I’m laughing so hard at Beth’s comment! Awesome job Vanessa!!!!!! 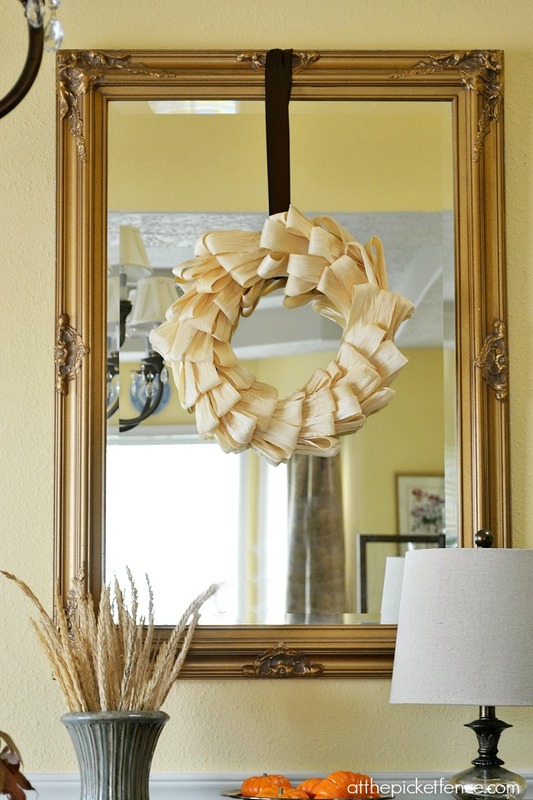 Everything looks amazing and that cornhusk wreath is a celebrity! Hahaha!! I hadn’t even seen Beth’s comment till I saw yours! LOL! Thanks for stopping by friend! 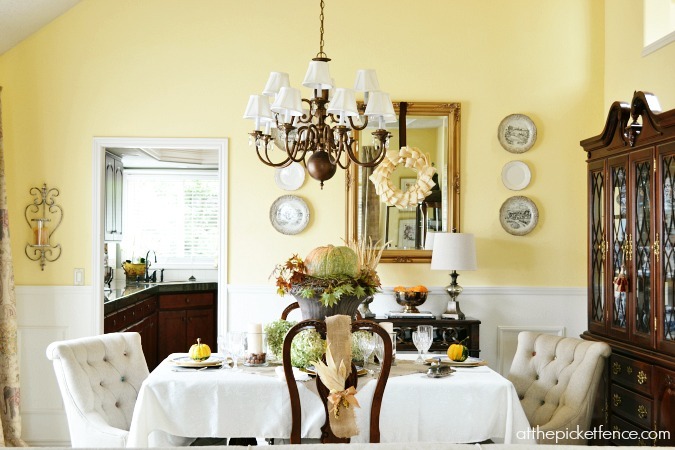 Luv your Fall décor…the chairs look GREAT!!! Everything is just beautiful and the added detail to the chairs brings everything so together! Great post, Vanessa! I think we all went thru the faux ficus tree phase…lol! Your natural decor is gorgeous! You’re right. There’s nothing like using naturals elements in our decor. I was married in the 70’s when we had real ficus trees that dropped leaves like Charlie Brown’s Christmas tree dropped needles. 😉 We also had a love affair with corn husks back in the day. Love all your natural touches. Mother Nature gives us the best materials in all seasons. Happy Fall. My mom had a real ficus and the leaves did the same thing Penny!! LOL! Thank you so much for coming by today! 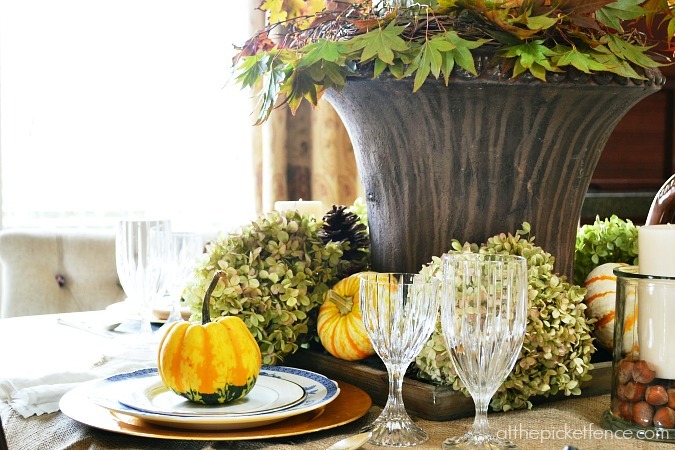 that wonderful pumpkin in the urn is Fall Tablescape perfection! I’m with you Vanessa! LOVE the real deal when it comes to fall. Your home and images are exquisite! 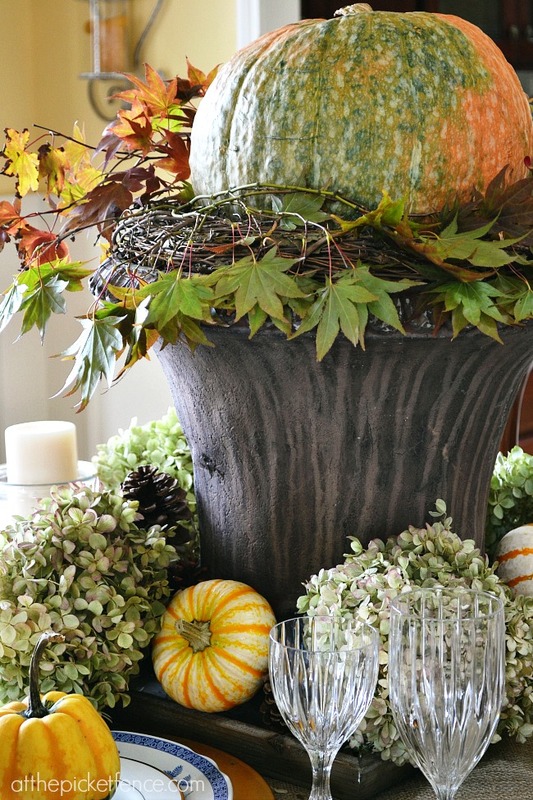 LOVE the pumpkin in the urn! Love this Vanessa! 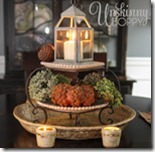 Those natural elements are the essence of fall and you’ve balanced them so nicely with your decor. The entire room is beautiful! I do think that the little extra touches on the chairs make it absolutely perfect though! Just gorgeous!! Beautiful! 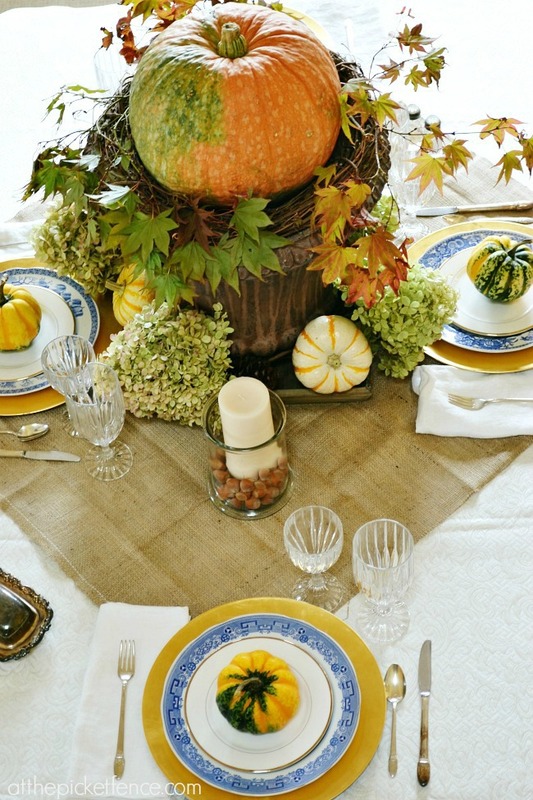 Your fall touches are wonderful; I especially love the Indian corn on the chairs.